A Rider Biomechanics Clinic will be held on Thursday January 29th at Pine Lodge School of Classical Equitation, Stoke Holy Cross, Norwich. The Clinic will be based on RWYM (Ride With Your Mind) and ‘Centred Riding’ techniques. The day will start at 10am and will be finished by 2.45pm. “So come and learn new skills, new insights, new feelings. Re-educate your mind and body in order to achieve greater balance, harmony and communication with your horse,” said Katherine Walker, Equestrian Performance Coach. The RWYM method, devised by Internationally renowned biomechanics coach and author Mary Wanless, is a tremendous advance in teaching and learning which helps the rider to organize their mind and body in exactly the same way as so called ‘talented’ riders. It encourages straight forward, streamlined techniques, increasing the rider’s body awareness and uses images to help one understand both what to do and how to do it. RWYM coaching is an extremely popular form of tuition in Europe and the USA and is proving to be increasingly in demand in the UK with incredible rider improvements obtained in a very short time, defying traditional expectations. Lessons will be 45 mins. The cost: £55 on your own horse or £65 on a school horse. (The horses at Pine Lodge School are mainly Lusitanos.) If you pair up the cost is £35 on own horse and £45 on school horse. Call Katherine Walker on 01508 521800 or Sue Barber on 07765 000869. T.E.N. Supplements has announced an impressive 25% seasonal discount offer on two equine calming supplements: Positive Calm Behaviour and Positive Calm Behaviour Plus between January 12th and 18th 2015. At this time of the year, many horse owners struggle to find the time or suitable weather in which to ride. For some horses, high calorie feeds may be required to maintain a healthy body condition score and to provide a balanced diet. Whilst hard feed may help to keep horses in peak health, the additional energy provided can have a dramatic effect on equine behaviour. Owning an excitable horse can take the fun out of riding, and this situation may call for a calmer of some sort. However, with so much written about the subject, and many myths surrounding the use of calcium and magnesium, owners are under pressure to find a suitable and safe alternative. Because every horse is an individual, T.E.N. Supplements offers two calmers in its range: Positive Calm Behaviour and Positive Calm Behaviour Plus. Buy either one of these two products between January 12th and January 18th and you can take advantage of the 25% seasonal discount offer. Fourteen year-old showjumper, Katie Waldock-Smith from Ware in Hertfordshire has been awarded the NAF Shining Star Award for December 2014 following an impressive display of commitment and talent during her time as a member of the British Showjumping Central Junior Academy. Mandy McGlynn, Lead Coach for the Junior Academy, nominated Katie for the award following a successful year for the teenager “Katie is a very talented young lady who has worked hard to bring on both of her ponies, Ross Cottage (Summer) and Clailu Saffron (Saffy). Both ponies qualified for the prestigious Horse of the Year Show and with Saffy, Katie jumped a double clear to finish fifth in the Pony Newcomers Championship. Katie has been a member of British Showjumping since September 2008 and she joined her local Junior Academy shortly afterwards. Since joining she has been working her way through the NAF Pony 5* Performance Awards Programme and has gained her 1* and 2*. She is currently working towards her 3* and is pleased to be have announced as a NAF Shining Star. Katie said “I was really pleased and shocked to hear that I had won this award as I did not know that I had been nominated. The Junior Academy has opened up so many competition and training opportunities alongside giving me lots of support and encouragement. Katie will receive some NAF products as part of her prize to add the supplements that she already uses, which include Hoof Moist for her ponies feet and In the Pink Powder for their digestion. Saffron Walden’s Seven Dwarfs steal the show! 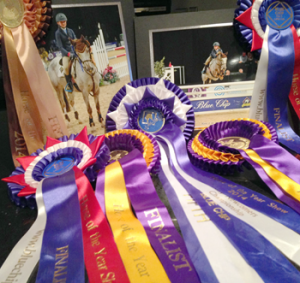 Saffron Walden RC based in Essex became the 2014 British Riding Clubs SEIB Quadrille Champions at Olympia, the London International Horse Show, on Sunday (21 December). It is not the first time that Saffron Walden RC has lifted the coveted trophy, having enjoyed several previous successes in this unique Championship. The club has become well-known for producing an extremely accurate, innovative and exciting routine, which is packed full of energy. 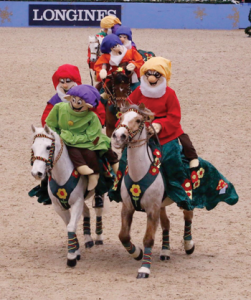 Their use of memorable music and a carefully choreographed floor plan in this year’s ‘The Seven Dwarfs’ themed routine delighted the audience, with many singing and whistling along as the ponies left the arena.